As I frequently read outside of rhetoric in my research, I am always interested in and often frustrated by treatments of "rhetoric" in those works, which is generally some version of Richard Lanham's Weak Defense: rhetoric is a specific kind of speech used to dress-up or dress-down content (I read discussions of "political rhetoric," "rhetorical devices," "rhetorical ploys," etc,). Generally, my response is "Hey chief, walk across the f-ing hall and talk to the person (or, if you're lucky, people) in your department or in your division who does this!" This is my disciplinary response, which is both reactionary and, I hope, well-earned. When I talk of philosophy, for instance, I can name people who are both currently publishing in it and who are also alive. I'm no expert; I don't know the intricacies of their discipline; but I am aware of and feel obliged to admit, acknowledge, and address it. So the reason for my frustration here what I take to be a general lack of interest in, engagement with, and respect for the current field of rhetorical theory or rhetorical studies. There are many explanations for this (and some are, admittedly, "our" fault), but I'm not after that today. 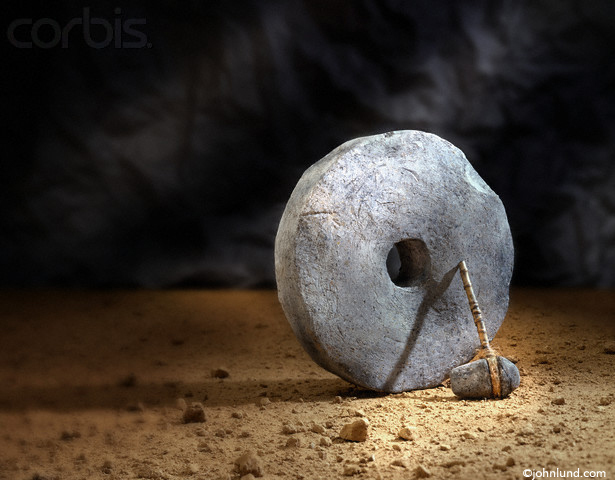 "Inventing The First Wheel: A Stone Age Rock Wheel." There is also, and this might even be worse, another reason for these kinds of oversights. I suspect that some of the authors I am talking about here are not as ignorant, uninterested, and disrespectful as they seem. (I know, I am being exceptionally nasty here. Just go with it.) Let me put it this way: one of the reasons I am drawn to much of this work (in philosophy, anthropology, cognitive science, literary criticism) is that it speaks so much to rhetoric as I (and others) know it. All of these disciplines and fields have so much to say about the contingency, the relationality, and the generally suasory operation of things: anthropology mustn't draw sharp lines between nature and culture; cognitive science needs to examine the roll of conventional practices in the development of cognitive capacity, philosophy needs to acknowledge the place of affect in treatments of reason. All these are arguments one can find within each of these disciplines. Thus, my admittedly less-than-generous reading of an absent, generous engagement with rhetoric is a recognition that since the Sophists, we have been over "this" again and again. Critical Affect Studies? Read Gorgias' Encomium of Helen! Such scholars as I have been reading want to make wheels in a market always already full of them. 1. Rhetoric must then be a specific kind of discourse. If it's more than that, then I've got a lot of reading to do. 2. Behold, I have invented the sphere! Pay no attention to Sophist selling wheels down the hall. Again, I embrace, read, and utilize such areas of research. And I would never argue that they are re-inventing the wheel. But a trip to patent office wouldn't kill them, would it? And I don't think there is much value in claiming, as I appear to be doing, that "we were here first!" It is about both giving credit where credit is due and, more importantly, about the value in learning from one another. Some sort of intellectual exchange is in order. For Plato, Gorgias. For Descarte, Giovanni Battista Vico. For Kant, Johann Georg Hamann.